Erosion can pose unique challenges to both residential and commercial construction projects and when trying to establish your landscaping. Erosion of the soil can cause expensive damage to property and it can also cause environmental concerns to nearby creeks, streams, lakes, and rivers if there is excess sediment. What Do You Need Erosion Control For? Green Acres Lawn & Landscape is a licensed and insured Kansas City landscaping company that specializes in erosion control services. 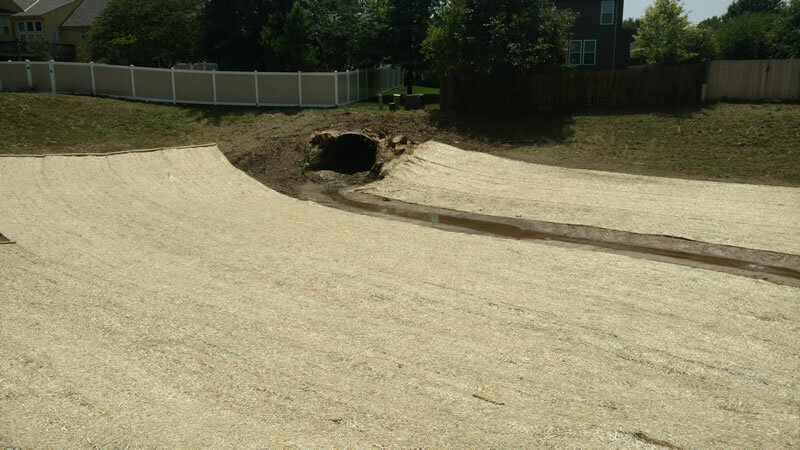 We provide erosion control services including property grading, drainage systems, silt fence installations, and retaining wall construction. Whether you have a steep slope that needs to be stabilized, a riparian zone you need to preserve and maintain, or flooding issues that are causing damage to your property we can come up with solutions to control and prevent further erosion. If you’d like to discuss erosion control services for your residential or commercial construction project or your landscaping please give us a call (913) 422-5111 or fill out our contact form and we’ll get right back to you.